To the casual observer the Florida Keys look remarkably similar, water, sky and mangroves. Everyone immediately recognizes the beautiful skies, clear water and endless shades of blue and green, but there is so much more than that. Each of the areas that we fish has a character of its own. Perhaps it is a geological difference, perhaps different fishing opportunities each area offers, or sometimes it is something as intangible as a sense of place. Whatever the reason, from the Everglades to the Marquesas, we are blessed with incredible variety and beauty. Every fisherman who visits Key West will inevitably end up fishing this ring of islands 20 miles west of the island city. Shaped much like a classic volcanic atoll (it’s not) with a ring of outer islands surrounding a protected inner harbour, the Marquesas offers just about every type of habitat seen in the Keys, all contained within a small "package.” Every game fish that can be caught in the Keys, can, with varying amounts of regularity, be caught in the Marquesas. From redfish and snook to cudas and sharks and all of the Slam species. Without a doubt, this area is witness to some of the world’s best fishing for permit and tarpon (both migratory and resident). It would not be too much of an exaggeration to say that on the appropriate tide every square inch of the place is frequented by some variety of game fish. The whole area is just "fishy". Yet, to talk only of the fish, does not do the Marquesas justice. The lush grass flats host the highest concentrations and variety of sea turtles that we know of in the Keys. In the hidden mangrove lakes, the elusive and rare Mangrove Terrapin Malaclemys terrapin rhizophorarom is often found. Depending on the time of year migrating birds can steal the show. Hawks and Falcons (Peregrines spend several months here) in the fall and Wood Warblers in the spring. Brown Boobies, Northern Gannets and occasionally Masked Boobies can by seen skirting the edges of the atoll. In recent years, these islands have been host to migrants of a different kind. Cubans, whether smuggled in on speed boats or braving the Florida Straits in homemade boats, make landfall here more and more frequently. A number of abandoned Cuban rafts can be found dotting the flats and beaches along the south side of the islands. With the exception of the somewhat heavy fishing traffic that these keys experience in May and early June, it is one of our favorite fishing areas. The fish, wildlife, and cultural history make this a special place. The Lakes is the name given to the flats and basins that extend west from Key West, beginning with the Tower Flats and ending at Boca Grande on the Ocean and encompassing Mule Key to Cottrell Key and past the Mullets on the Gulf of Mexico. This area offers wide open vistas, with only a handful of islands dotting the horizon. Turtle grass "pastures" extend for miles in every direction. These flats, along with the hard charging currents are the perfect ingredients for successful permit fishing. Throw in the blue skies of spring and fall and a 15kt breeze and you might as well consider the fish caught. Mudders, tailers, and cruisers, schools or singles, the area has them all, often in excess. A perfect late winter or early spring day can be spent hunting mudding singles on the first of the ebb tide while marveling at a flock of northern gannets flying over head as they migrate to their breeding grounds in Canada. Talk of permit alone would be foolish as the Lakes also provide some truly fantastic angling for migratory tarpon. From early season laid-up fish to the countless strings and schools that follow the Atlantic fish lanes. The spring tarpon fishing opportunities here seem almost endless. Our favorite methods are poling the expansive flats looking for large fish laid-up in the turtle grass basins and, when conditions are right, enjoying the bacchanal delights of shrimp and guppy hatches. See one and your life will never be the same. When this gets slow, a quick run to the Atlantic puts you right back into the game. White sand and black fish is never easy, but it sure is fun. This is the area where the four of us first fell in love with flats fishing. From the early days when any fish sighting was celebrated to today when expectations are much loftier (Slam anyone), this is where we learned and are still learning to flats fish. Every species is available most days of the year. The proximity to Key West can lead to some crowded (by Lower Keys standards) conditions, but the fishing rarely suffers. One could fish a whole career in just a few of these basins and never wont for fish, though that does seem a bit boring. Sometimes overlooked as the first choice for a day's fishing, this area still holds magic. Slick calm summer and fall fishing is always special. Bonefish tailing with first and last light is one the highlights of the year. Cherry picking productive edges for large, sometimes too large, tarpon is a spring time ritual. When the numbers of large ‘poons diminishes, their smaller cousins invariably take their place. The falling tide on the Gulf is sure to find permit hunting for a meal. In fact, on certain tides, it is possible to target permit that are actively feeding on crabs drifting on the surface. These annual hatches are fairly predictable and provide some intriguing angling opportunities, not for the faint of heart. This area has some of everything. Big Pine Key marks a major geologic boundary. From the mainland down, all of the Keys are composed of what is known as Key Largo Limestone. Fairly young, in geological terms, fossilized coral makes up the spine of the Keys, that is, until we reach Big Pine Key. Here the Key Largo Limestone gives way to Miami Oolite, a much older material. The implications of this change on the overall flora and fauna is much too complicated to get into here, but how it affects the fishing is not. Gone are the enclosed basins that separate the Gulf from the Atlantic that is the hallmark of the Key West backcountry. Replacing it are deep vertical (i.e. north to south) channels with islands and banks separating them. Hard charging currents and easy access to deep water make this area a haven for game fish. The bonefishing is on par with anywhere in the Keys, lacking only the concentrations of truly giant fish found in the “Downtown” Islamorada area. Permit fishing, whether on the many banks for tailers or off the edges for schools of floaters, is often excellent. Despite this, what sets this area apart is the summer and fall fishing for resident tarpon. Depending on tide and weather conditions, there may be few places on the planet that offer more consistent angling for these fish (Everglades being the possible exception). There is no need to go to Mexico. Fish under trees, schooled up on edges or laid-up in depressions, the opportunities are countless. Better yet, with the exception of two tournament weekends in the late summer, the fishing pressure is minimal. Most of the summer and fall the only company is the roosting Frigate Birds, ubiquitous Egrets, Herons, and shorebirds, and the soaring kettles of migrating raptors. Best of all the Least Terns, newly arrived from Central America, which alert us to shrimp and guppy hatches. This is the kind of company we prefer. Where to start? It would take lifetimes to fully understand just a portion of this vast area. 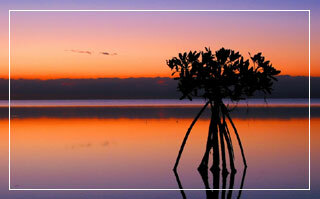 The Everglades extend from the sawgrass prairies just south of Lake Okeechobee to the barrier banks in Florida Bay. This is truly a world of its own. As one travels from Islamorada toward the mainland, the species that inhabit the shallows changes. The bonefishing on the perimeter of the Park is world class, producing record class fish every year. As Islamorada disappears on the horizon, the bonefish gradually give way to redfish. While there are areas that support both species, the closer that you get to the mainland the greater the concentration of redfish and snook. The one year-round constant in this vast area is tarpon. The numerous basins and edges harbor some of the world’s finest fly fishing opportunities for these game fish. During the early mornings of the summer months, you can witness tarpon rolling in every direction as far as the eye can see. On warm winter days, large resident fish bask in the shallow muddy waters. But the Everglades are more than just fishing. The bird life of the Park rivals that of anywhere in the world. Grass flats are carpeted with innumerable Egrets, Herons and Roseate Spoonbills while Swallowtail Kites, Wood Storks and Bald Eagles soar overhead. To the lucky visitor, America’s only flock of wild Pink Flamingos is occasionally seen. All winter long armies of White Pelicans, “flying buffalo,” feed in large flocks across the deeper basins and pockets. On the mainland, the rare Crested Caracara, endangered Cape Sable Sparrow and Snail Kite can be found. Add to that American Alligators and Saltwater Crocodiles (the only place in the world where alligators and crocodiles coexist) and Everglades National Park is unlike anywhere else. To fish in the company of the numerous wild creatures is worth the effort of reaching the Park. The Everglades presents the four of us a blank canvas and we relish the time spent here learning just some of this wilderness’s secrets.